The kids and I, along with our friend Shannon, hiked two mountains this past month but we never reached either summit. We are tracking our “numbers” — elevation gain and mileage — in our attempt to get into shape for bigger mountains to climb this summer, but we have learned to keep our adventures fun even if it means not getting to the actual summit. 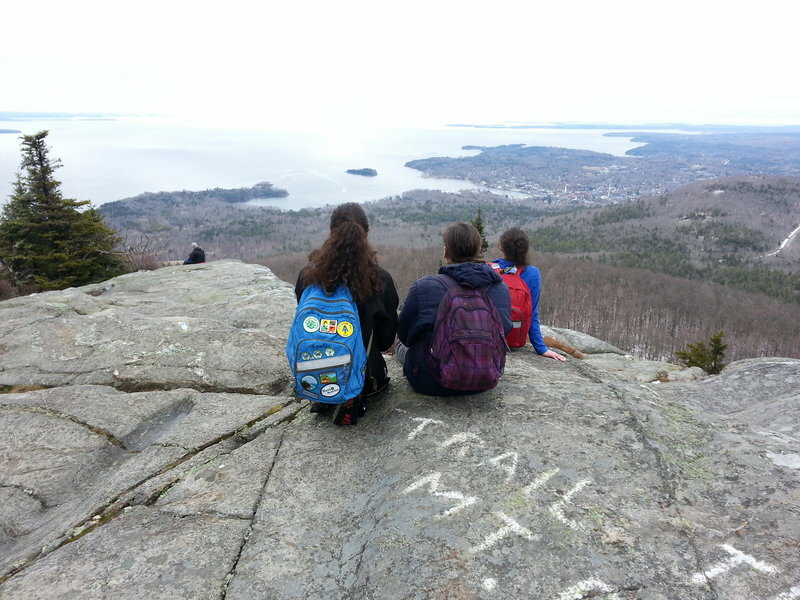 Our first mountain was Mount Megunticook in Camden Hills State Park. The last time we climbed this mountain, it was a 95-degree day. We wanted to tackle this one again when the temperatures were cooler and the backpacks weren’t laden with extra water bottles. We had to park outside the entrance gates at this time of year, so that added a bit to our mileage, but it was a lot easier in the cooler temperatures (and lighter packs). According to the AMC Maine Mountain Guide (and a friendly couple we met) the summit is actually in a wooded area with no nice views. The Ocean Lookout offers the best view on the mountain, which is about 135 feet below the actual summit. Since we still managed to hike about a 1,000-foot elevation gain, we felt like we accomplished our goal for the hike and set up our picnic lunch to bask in the springtime sun. 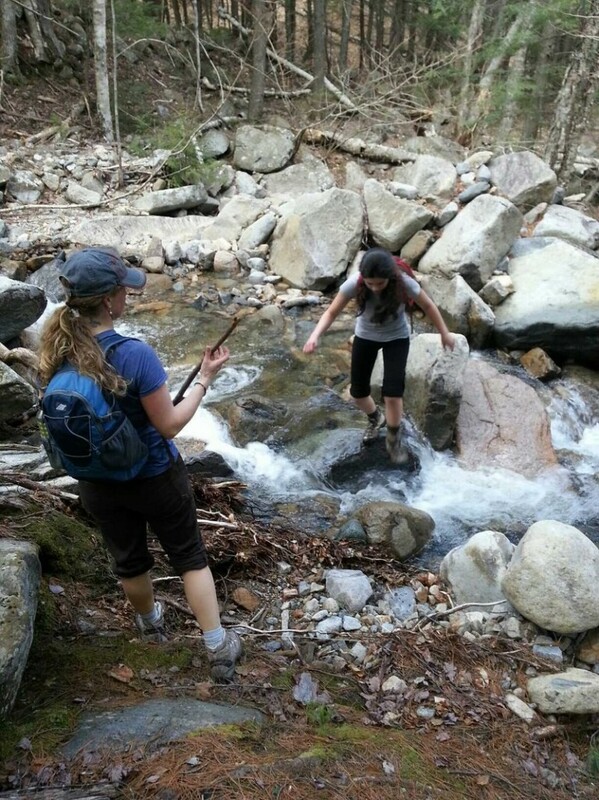 The Red Ridge Trail on the Moat Mountain Trail loop in the White Mountain National Forest included a great deal of rock hopping across several small streams and one large one. A couple of weeks later we attempted to climb the Red Ridge Trail on the Moat Mountain Trail loop in the White Mountain National Forest in New Hampshire. We have hiked a short part of this trail many times to the waterfalls at Diana’s Baths but we’d never gone farther than the falls until this trip. I saw from trail reports that there wasn’t much snow on the Red Ridge Trail but that caution should be used at river crossings at this time of year because of high water. We found ourselves doing a lot of rock hopping across several small streams (and one big one) on the trail. One crossing offered nothing to walk across above the water line. After some debate we decided to cross the river barefoot. It was not a fast-moving stream nor was it deep, but my 15-year-old found the temperature uncomfortably cold. My daughter said she will never again underestimate the coldness of a mountain stream in spring. We spent the first couple of miles on easy, fairly level terrain. But when the trail headed upward, it was steady and arduous. This trail was one of those times that despite examining the trail map in detail, the reality of the elevation gain was more than we expected. Once we hit the open ledges, we were presented with several maybe-it’s-the-summit views as we climbed. But we found that once we got to the top of that ledge, there was another one right behind it. We never did get to the “unnamed summit” of the Red Ridge Trail (which is at the intersection of Moat Mountain Trail). According to my 15-year-old and Shannon, this trail felt like it was “the mountain that never ends.” Words to this effect (or possibly a bit more colorful — my memory is hazy on this point) were yelled from a spot when yet another view revealed that we still were not at the top. This is the point when we made the call to stop. We had already completed a 2,000-foot elevation gain (the highest of the season for us so far) and we reasoned that if we had continued, it would have lost its fun. Other than bragging rights, there wasn’t any real reason to push ourselves. So we turned around and expounded on the amazing views of the White Mountains, laughed about our strategies for water crossings and pondered which mountain we might tackle next. The fact that we were talking about the next mountain adventure confirmed that we’d made the right decision to head home. Because in the end it’s more important to me (and the kids) to have fun. Otherwise, why do it?